One of the earliest accounts of the culinary use of Wild Scottish Juniper in Scotland is from John Lightfoot in 1777 who claimed the highlanders of the 18th century had a diet was still widely that of a “hunter gatherer,” and juniper was one of the most widely used seasonings; found in spirits, jellies, and seasonings, in a manner similar to how black pepper is used today. 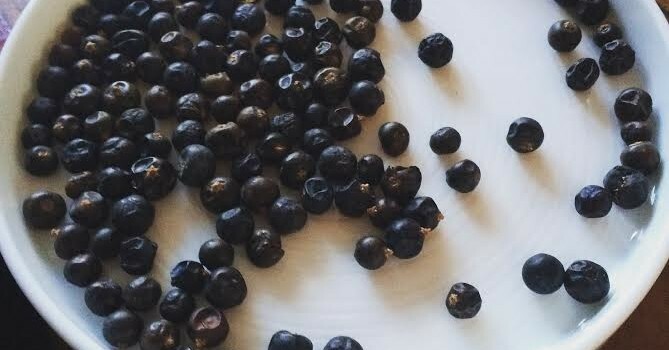 In the 17th century, juniper was one Scotland’s important exports, with berries collected in the highlands being exported to Holland for the production of genever. Its formerly wide distribution is considered to have been one of the reasons a large portion of the British gin industry relocated to Scotland during the wars early in the 20th century. Found across the entirety of Scotland, including Orkney and some western Isles, wild Scottish Juniper thrives in drier, mountainous areas, with the overwhelming majority found in the Highlands occurring as part of mountain e scrub vegetation, mainly in pine and birch woods. Very slow growing, it can achieve heights up to 10 metres, and can live up to 100 years. Similar to pine, the foliage consists of needles, up to 1cm long. The needles have a blue-green hue with a broad white band on their inside surface. The bark is brown while young and turns grey with age and it is a deciduous tree with male and female flowers on separate trees. Male flowers are small, yellow, and globular. The fruit, main part used for culinary purposes, are wind pollinated and develop into fleshly purple aromatic, berry-like cones. Through a combination of historic over harvesting, miss-management, and disease, juniper stocks across the country are at risk. The majority of Juniper used in Scottish cooking and spirits production is imported from abroad. Once abundant, 79% of plants are too old to old to produce a sufficient number of berries, with juniper now considered to be one of the rarest plants in the UK according to the Woodland Trust. In addition to the age of Scotland’s juniper population, a new disease, phytophthora austrodedri, is attacking plants across the country. According to a new report by Plant Life Scotland, up to 63% of juniper stock is infected, causing a reduction in productivity and a browning of trees across the country.